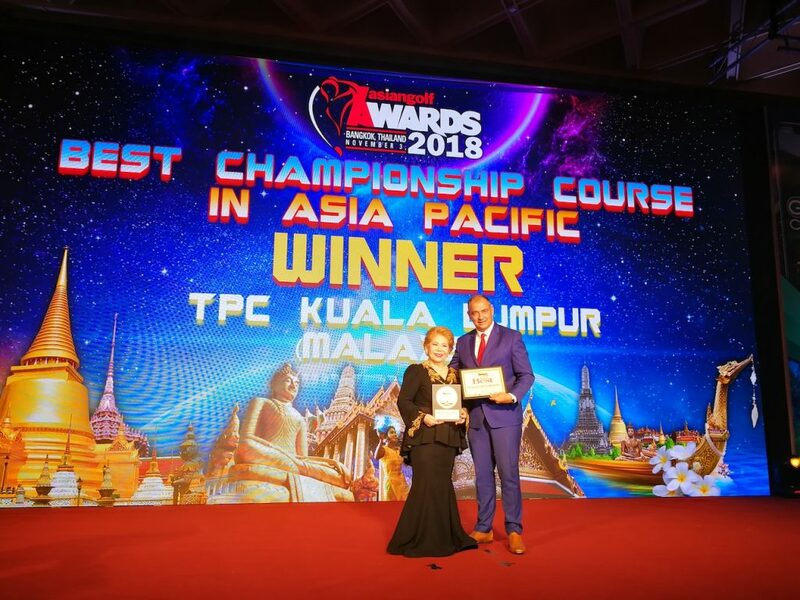 TPC Kuala Lumpur achieved the crème de la crème of the Asia Pacific recognition in the form of six most outstanding achievements at the 2018 Asian Golf Awards organised by the Asia Pacific Golf Group at the Hyatt Regency in Bangkok recently. The Asia Pacific Order of Zenith and Legion of Leaders are two exceptional categories of awards which saw TPC Kuala Lumpur and Steven Thielke; the club’s Chief Executive Officer as the respective recipients. The Asia Pacific Order of Zenith as the award’s name suggests, is a very exclusive recognition that excels and exceeds any standard in the industry. The Legion of Leaders award is a special tribute designed to single out outstanding men and women in the golf club management industry for the exemplary role they have played and continue to play in promoting all-round excellence in the club industry. In addition, TPC Kuala Lumpur’s Head of Agronomy Mohd Nizam Othman bagged the Best Golf Course Superintendent of the Year award for the third time, Best Championship Course in Asia Pacific and Best HR Manager for Azhan Kadir awards for the second year in a row, and Loh Chyi Jen was voted Best Marcomm Manager of the Year. “The journey to be where we are now has been an amazing one. Malaysia is blessed with a strategic location and has ample resources for golf development. I hope there will be more exciting roads ahead for the club and Malaysia. Thank you so much to all members, staff and management for the support and we will always continue to deliver the best,” added Thielke. The Asian Golf Awards is the only pan-Asia Pacific Award programme of its kind for the golf industry. It has established itself as both the “Oscars” for the industry and a very distinguished measure of excellence by which the industry measures its very best. TPC Kuala Lumpur has set an impressive track record with its multi-award-winning milestones. Since becoming part of the highly acclaimed TPC Network, TPC Kuala Lumpur, owned by Sime Darby Property, has made it to the Top 100 World’s Greatest Golf Courses, Top 100 Platinum Golf and Country Clubs of the World and Top 100 Golf Courses in Asia.